The National Health Service has long been a rich source of inspiration for media of all sorts, from radio discussion programmes to documentaries to fiction. Prominent examples for the first decade include the regular BBC series, Your Life in Their Hands, which ran from 1958 to 1964, and focused on surgery in the NHS. Around the same time, there was On Call to the Nation (1958), a scripted representation of the service acted by NHS doctors and nurses. Health for the People, a BBC documentary on the NHS, was first broadcast in 1955. It brought the National Health Service to those with television screens, forming part of the process by which citizens came to imagine the NHS, the people that worked in it and used it, its role in society and the services it provided. For those able to see it Health for the People provided a comprehensive view of the state of socialised medicine in Britain seven years in. 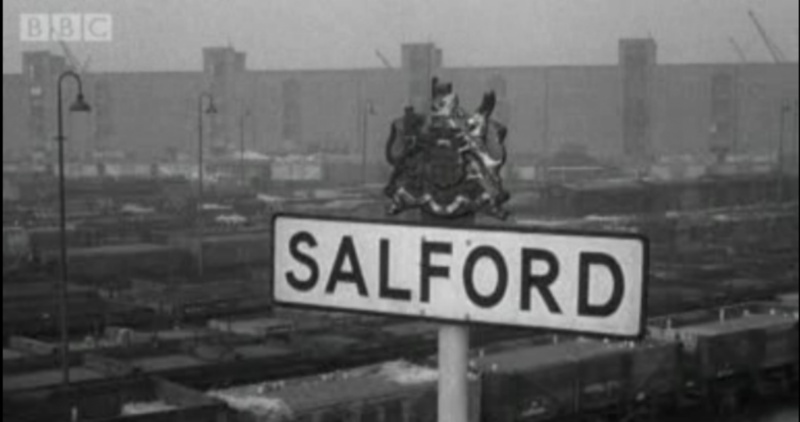 The documentary begins with a brief tour of the industrial city of Salford, moving from railyard to dockyard, then to bleaching works, dye works and cotton mills, and finally to images of working men and women, walking to and from work amongst terraced houses, and of pensioners chatting on the street. Finally, we see one small children carry another up narrow and uninviting looking steps in the slum of Hanky Park, as the narrator informs us that Salford has forty thousand children, “children, who can never know when spring comes, there are no trees and no flowers on Primrose Hill”. The choice to situate Health for the People in one of Britain’s “industrial areas”, one famous as the setting for Walter Greenwood’s famous novel of inter-war want Love on the Dole, draws our attention to the extent to which the early NHS was understood as a reaction to that period. The role of the service here was as slayer of the Beveridge Report’s five giants – want, squalor, ignorance, disease and idleness. Whilst concerns over whether the middle classes would join the scheme drove early films produced by the Ministry of Health, the BBC’s documentary crew were more interested in The Welfare State as a response to the mass unemployment of the 1930s and what was happening in Salford’s “grim back to backs” with their enduring poverty. The image of the NHS, and by association the Welfare State as a whole, presented here roots its development in the hungry thirties and as part of a narrative of social advance. That story remains present in our first exposure to an NHS locale – a doctor’s surgery. Here, the doctor, in a distinctly middle class Lancastrian accent, tells us about the “virtues” and “snags” of the new scheme. Discussing his patient’s anaemia and the regular injections required to combat it, he reminds the viewers that barriers to care before the NHS were about the stigma of poverty as much as the reality of payment, and hails the transformation in mentality brought about by the introduction of the health service, before lamenting his full surgery and the minority of hypochondriac patients who see dropping into the doctor as akin to visiting the butcher’s and the greengrocer’s. The single-handed family doctor is a significant figure to open the documentary with. This kind of physician, working alone in their own surgeries and in this case in what was essentially a family business, were perhaps the part of Britain’s pre-NHS health services that was most resistant to integrating into the new scheme. The hostility of many GPs was perhaps the greatest obstacle to overcome in founding the NHS and their continuing cooperation was not always guaranteed. His verdict that “in spite of these difficulties, I think the general practitioner can now do very much more for his patients than he did before” really mattered. Following the reassuring endorsement of the GP the film makers commence a remarkably thorough tour of the NHS’ services, giving us images of many of its various spaces and of its workforce. We see a chemist explaining why workmen preferred to get their prescriptions there rather than lose wages waiting in the doctors’ surgery. A uniformed district nurse, paid for by the local authority but employed by the Queen’s Nursing Institute, visits a patient to help with his bronchitis. Hospital ancillary workers wheel patients around, sterilise equipment and cook food in an old, dilapidated hospital, whose matron is then called upon to discuss the grave shortage of nurses and her worries for the future. We then move to a “bed bureau”, where a clerk is on hand to advise various practitioners on bed availability across the service, followed by a pathology laboratory, an antenatal clinic, then a psychiatric hospital and finally to the school health programme. That the matron is afforded the chance to speak in the hospital is significant. Health for the People creates an image of work in the NHS as something hugely varied, with workers of all types busily carrying out a variety of tasks related to healthcare, but with only certain categories of employee allowed to speak for it. The GP, the chemist, the matron, the hospital consultant, the medical officer of health, the psychiatrist all describe their services, discuss any problems and any solutions they’ve created. The midwife, the nurse, the porter, the cleaner, the bed bureau clerk, all contribute only their work, never their judgement, with the narrator rather than the worker explaining their practice. The obvious exception to this, the health visitor, who we follow around Salford’s streets and inside its terraced houses, speaks largely to facilitate a tour of public health and popular attitudes around the city, rather than on the health service per se. What sort of image did Health for the People present of the NHS? Unusually perhaps, it does depict the service in much of its variety. We see a broad cross section of the different component parts of the NHS and the help they offer to the community. Through the tour of the antenatal service and the public health laboratory we get a sense of medical advance and innovation through the state service. We also get images of most of the different kinds of employee who were working together to make the NHS a reality. In that sense, despite its focus only on the voices of high-level professionals, it did enable the television viewers of 1955 to imagine the NHS is its broadest sense. What are your impressions of the NHS from Health for the People? Do you remember seeing it in 1955? Let us know in the comments.